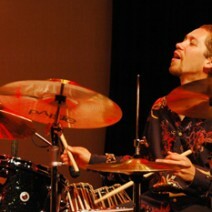 Drummer and percussionist Richie Barshay, most noted as a member of Esperanza Spalding’s Radio Music Society and also a member of the Herbie Hancock Quartet since 2003, has established himself as a prominent musical voice of his generation. Regarded as “a player to watch” by JazzTimes magazine, he maintains a busy international schedule with some of today’s top artists including Hancock, The Klezmatics, Kenny Werner and Chick Corea among others. In September of 2004 he was named an American Musical Envoy by the U.S. State Department, along with the renowned Latin-Jazz ensemble Insight. Now based in New York City after 5 years on the Boston music scene, Richie began playing Jazz and Afro-Latin music during his youth and has expanded his focus to Indian rhythmic concepts and tabla, inspiring his 2005 recording debut “Homework” and the launching of his new band, The Richie Barshay Project. For more about Richie, visit www.RichieBarshay.com.